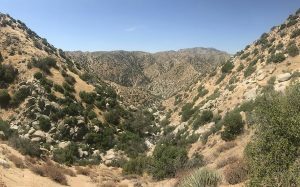 If you remember reading my previous post about Deep Creek, you’ll recall me mentioning that this is a hike you really need to be prepared for. It’s a long hike in the desert with an uphill slope on the way back- so save your water until the end. Well, when we went last year, a couple of my friends were less than prepared for it. In fact, when we started the hike, I had to give them my backup water, as they had none. They brought no water to a hike in the desert. That was a red flag. I should have just told them we couldn’t do this hike, but I wasn’t thinking that day, apparently. The hike to the hot springs was relatively simple with some serious downhill action. But it wasn’t too hot yet, and we had plenty of water. After spending some time having fun and getting dehydrated in the hot springs, we were ready to head back. Now, the first big leg back from Deep Creek is an extremely steep hill that goes up. Though we did stop many times, one of my friend’s fear of heights mixed with him being out of shape wound up a deadly catastrophe. As we got up to the top of the hill, he started hyperventilating because he was getting weak. Rather than helping, our other friend began panicking and yelling that he was having a heat stroke, which is really not the thing to do when someone is panicking. So, he began to panic more. Because of that, he passed out. So, our yelling friend dumped some of our drinking water (not a good idea) over our friend to “help.” Now, we were stuck with one friend who was just starting to come to and other friend who was panicking and making bad decisions. And we had very little water left. It was like a scene from a movie. So, as I began explaining that the best thing we could do is give our friend water TO DRINK and wait for him to get his strength to continue (the hardest part was over), our yelling friend began giving the worst advice imaginable- to split up. Now, just like in Scooby Doo and Dungeons and Dragons, splitting the party while hiking is a bad idea. As I began fighting him, he continued to escalate the scene, which wasn’t helping anyone. So, as a more experienced hiker, myself and another friend went back to the check-in station for help. But the check-in station was a half mile farther than where our car was, and no one gave us the car keys… smooth thinking. So, our journey back was much longer than it should have been- at least 3 miles in total. Next, my husband followed behind us with the keys trying to catch up. Again, not a very smart move to go out on his own…but here we are. He didn’t really have any other choice. Our yelling friend stayed behind with the friend who had passed out. Again, not a good decision. Luckily, hikers are usually nice. And this was a situation where we really could rely on the kindness of strangers. Many strangers gave our sick friend snacks and water. This magically fixed him. Perhaps his blood sugar was low? Regardless, he was getting better. That 3 mile walk back was more than arduous, seeing as how I left almost all of our water with our friends. But I figured I could handle it more than they could. As we made our way back, the trail ended with a steep up-hill climb. The friend who was with me started losing it, so I helped encourage him up the hill, as I got a second wind. It was at this moment when we realized that we didn’t have the keys. So, as I mentioned, we walked the additional half mile to the check-in station. There, we used their big drinking water tank to fill up our bottles and then filled up more bottles. At this point, my husband caught up to us with the car, and we made our way back to the beginning of the trail. Our friend who was passed out, who was fine at this point, slowly started back, as the only way to get him out otherwise was via helicopter, which he hated the idea of more than dying alone in the desert. So, those last two began their slow journey back. As new hikers began the trail, I would give them the water bottles I filled up and say, “If you see two people who look like they shouldn’t be hiking this trail, please give this to them.” I would give them snacks, as well. And somehow, it worked every time. Our friends got our snack and water deliveries via new hikers. And, after getting lost because they weren’t paying attention, they made it back. In retrospect, as the one researching and recommending this hike to my friends, I should have done more research and given them more advice to come better prepared with more water- my bad. But who goes to a hike with no water? I’m just saying… But, we all laugh about it now. We had a real adventure out there in the desert that day, and that was an experience I wouldn’t trade for anything. And our friend who passed out was fine! Though, he has decided hiking is not for him. I tried to get him on a plan where we start out small and work our way up…but I guess after almost dying in the desert, most people wouldn’t be down for the same experience again!